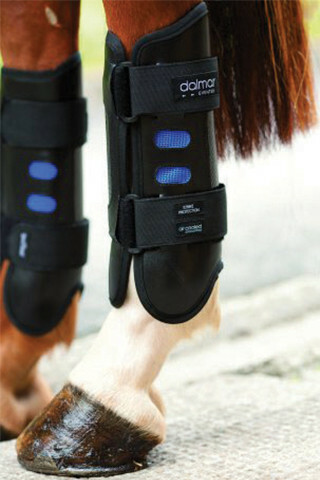 Air Cooling - Conventional Boots and Bandages insulate the horses tendons and prevent heat from escaping. The Dalmar patented cooling system utilizes the high speed cold air hitting the front of the horses legto pass through the boot and to cool the tendons while the horse gallops. Carbon Fiber Strike Protection - In the event of an accidental strike the force of the impact is distributed over the entire length of the boot and immediately deflected away from the horses Flexor Tendons and Suspensory Ligament. Click the button below to add the Dalmar Eventer Hind Boots to your wish list.